H.E. Mr. Emomali Rahmon was born on October 5, 1952 in Danghara, Tajikistan. In 1982, he graduated from the Tajik State University with Diploma in Economics. During the same year Mr. Emomali Rahmon was promoted to be the Chairman of the collective farm in Danghara region. From 1976 to 1988 Mr. Emomali Rahmon was the Chairman of the Union Committee of the collective farm in Danghara region of Kulyab province. He also held various positions in the leading Government divisions at that time. In 1992, Mr. Emomali Rahmon was elected as the Chairman of the Executive Committee of Kulyab province and the Chairman of the District People's Representatives' Body. Later that year he was elected as the Chairman of the Supreme Assembly of the Republic of Tajikistan. On November 16, 1994, Mr. Emomali Rahmon was elected as the President of the Republic of Tajikistan. In November of 1999, Mr. Emomali Rahmon was re-elected as the President for a seven-year term. 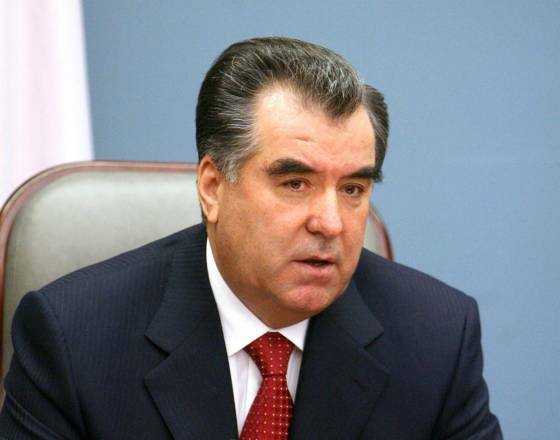 During the next presidential election, on November 6, 2006, on the basis of an alternative, free and transparent election Mr. Emomali Rahmon was re-elected as the President of the Republic of Tajikistan for a seven-year term. The President is married and has nine children. Mr. Emomali Rahmon is a recipient of a numerous honors including 2000 World Peace Corps academy Gold Medal award.